We all know the doctor wants us to eat more veggies and lean proteins every day so why do we choose potentially harmful food for our dogs? A balanced diet is just as important for your furry friend as it is for you! Nutrition is key to growing strong muscles and bones, having a beautiful shiny coat, and give your dog all the necessary energy they need throughout their day. Dog food manufacturers spend millions of dollars to create the perfect food for our pets, but sometimes, byproducts and specific ingredients can be detrimental to your dog. This is why its important for every pet owner to know what they are feeding their pets and what nutrients will help their beloved furry friends live a long healthy life! Dogs share a lot of dietary characteristics which are surprisingly similar to humans. Some mammal species require a pure meat diet (carnivores) while others need purely plant-based foods (herbivores) but, humans and dogs can eat both (omnivores) and require a mixture for meat and plant-based proteins (Source 1). Because dogs need both, their tooth structure and intestinal tract are now perfect for eating either in their diet. Dogs have evolved to eat food that their human companions give them so they can eat cooked foods and can process carbohydrates. While they have more advanced digestive processes than another animal, it doesn’t mean they can eat anything placed in front of them (including shoes!). The level of vitamins our furry friends require is much different than what our daily needs are, but the vitamins remain the same! For example, carrots and spinach have a lot of Vitamin A which helps with “growth, fetal development, immune function and cell function” (Source 2). If vitamins play such an important role, it makes sense to give your dog various foods that have vitamins, right? Well, some foods are toxic to dogs, and dog parents everywhere may be giving their pets potentially harmful foods! I think every veterinarian recommends never giving dogs chocolate, but the same can be said for citrus, grapes or raisins, milk or dairy products and even onions or garlic. These foods may contain essential vitamins but may take a toll on your pets digestive tract and may lead to terrible side effects or even organ failure. The ASPCA has compiled a list located here (Source 3) that goes over the various foods that dogs shouldn’t eat if you are interested in more details! Eating the right food is sometimes hard to nail down because different brands offer different strengths vitamins. Each dog comes with individual allergies, likes, and dislikes so it’s vital to try various foods before committing to just one brand. The problem is dog food manufacturers, such as Mars, don’t have to release their scientific research on their brands leaving many veterinarians and consumers left to wonder what their pet is consuming! Independent studies have concluded that various products are a “no-go” for many dogs which include “4-D meat products”, or meat unfit for human consumption, corn, grains, and preservatives and dyes (Source 4). Brands such as Purina, Kibbles N’ Bits, and Iams Dog Food are found to have one or more of these ingredients, so a general rule is to buy dog food with recognizable names (Vitamin and Nutrients) and food you wouldn’t mind eating yourself! 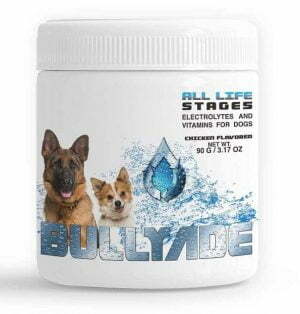 Bullyade is chock full of electrolytes and essential vitamins such as Vitamin A all the way through Vitamin K.
Whether it’s used as a supplement to increase your dog’s vitamin intake or used to treat dehydration, Bullyade is perfect for your furry friend’s needs! 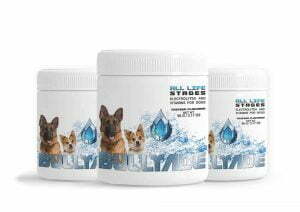 It helps regulate over 200 vital processes and is recommended by veterinarians, dog breeders, and professionals all over the world. We hope you enjoyed this article and if you found this content helpful please leave a comment below and visit our dog help center, and let us know what you think! 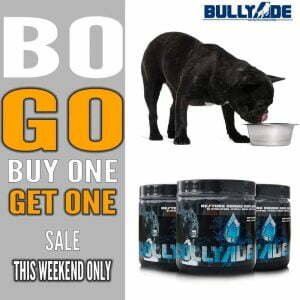 Bullyade is available on Amazon or you can shop directly at www.bullyade.com Bullyade also ships worldwide!